While it might come as a shock, they're not very different from what you might find on any new car sitting in the lot at Bill Gaddis Chrysler Dodge Jeep Ram. 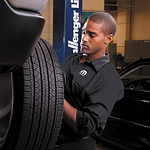 The road hazard tire and wheel protection policy includes the repair or replacement of all four tires and wheels if they're damaged due to any problem with highway conditions. Mopar® only uses certified factory or aftermarket parts, so you don't have to worry about getting substandard equipment. They'll even cover the cost of mounting, balancing and and putting on the stems. Considering how the roads have been looking in Muncie lately, this is good news for drivers of any new or certified pre-owned Chrysler.